What’s it really like to be a chemist? Leading chemists share what they do, how they do it, and why they love it. “Letters to a young …” has been a much-loved way for professionals in a field to convey their enthusiasm and the realities of what they do to the next generation. Now, Letters to a Young Chemist does the same for the chemical sciences. Written with a humorous touch by some of today’s leading chemists, this book presents missives to “Angela,” a fictional undergraduate considering a career in chemistry. The different chapters offer a mix of fundamental principles, contemporary issues, and challenges for the future. Marye Anne Fox, Chancellor of the University of California San Diego, talks about learning to do research and modern physical organic chemistry. Brothers Jonathan and Daniel Sessler explain the chemistry of anesthetics that make modern surgery possible while Elizabeth Nolan talks about biological imaging. Terry Collins talks about green chemistry, a more sustainable way of doing chemistry, while several authors including Carl Wamser, Harry Gray, John Magyar, and Penny Brothers discuss the crucial contributions that chemists can make in meeting global energy needs. 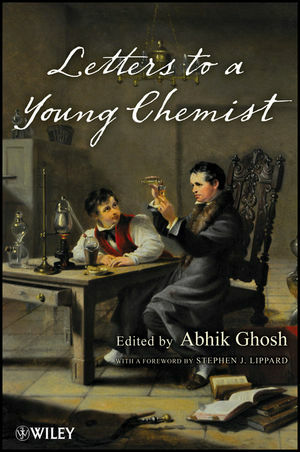 Letters to a Young Chemist gives students and professionals alike a unique window into the real world of chemistry. Entertaining, informative, and full of honest and inspiring advice, it serves as a helpful guide throughout your education and career. Abhik Ghosh, Editor, is a professor of inorganic and materials chemistry at the University of Tromso, Norway. A former Senior Fellow at the San Diego Supercomputer Center and a frequent Visiting Research Fellow at The University of Auckland, New Zealand, he has recently completed a term as an Outstanding Younger Researcher of the Research Council of Norway. He serves or has served on the editorial advisory boards of the Journal of Inorganic Biochemistry, the Journal of Biological Inorganic Chemistry, and the Journal of Porphyrins and Phthalocyanines. His research interests lie at the intersection of bioinorganic, materials and computational chemistry. Part I From Fundamentals to Applications. 1. Let's Get Physical (Marye Anne Fox). 2. In Silico: An Alternate Approach to Chemistry and Biology (David A. Case). 3. The Purple Planet: A Short Tour of Porphyrins and Related Macrocycles (Abhik Ghosh). 4. Anesthesia: Don't Forget Your Chemistry (Jonathan L. Sessler and Daniel I. Sessler). 5. The Green Evolution (Terrence J. Collins). Part II Chemistry and the Life Sciences. 6. Thinking Like an Enzyme (Judith P. Klinman). 7. Making Sense of Oxygen (Marie-Alda Gilles-Gonzalez). 8. Let’s Visualize Biology: Chemistry and Cellular Imaging (Elizabeth M. Nolan). 9. Bioinorganic Chemistry: Show Your Mettle by Meddling with Metals (Kara L. Bren). 10. Better Than Sliced Bread (Chaitan Khosla). 11. Choreographing DNA (Cynthia J. Burrows). 12. Supramolecules to the Rescue! (Seth M. Cohen). 13. Biomaterials at the Beach: How Marine Biology Uses Chemistry to Make Materials (Jonathan J. Wilker). 14. The Advantage of Being Small: Nanotechnology (Michael J. Sailor). Part IV Chemistry and Energy. 15. Happy Campers: Chemists' Solutions to Energy Problems (Penelope J. Brothers). 16. Clean Electrons and Molecules Will Save the World (Carl C. Wamser). 17. Metals, Microbes, and Solar Fuel (Harry B. Gray and John S. Magyar).